We are constantly seeking more Tutors from Griffiths-trained paediatricians and psychologists who are experienced in using the Assessment tool and have teaching skills. 1. Be a registered user of Griffiths III. 2. Be a paid up member of the ARICD. To join, go to how to join . 3. Have had experience using the Griffiths Scales on a regular basis in the immediate or recent past. 4. Be willing to comply with ARICD Standards of Training set by the Training Committee. 5. Teaching, tutoring, and managerial experience is an advantage. 7. Pass the Tutor e-learning module. Ensure your ARICD account details are up to date. 2) Ideally a Griffiths III Tutor who already knows the applicant, possibly one of their original tutors. Applicant sends the Referee proforma to their referees who then should send the references to the Chair of the Training Committee by e-mail. Chair of the Training Committee reviews the application and evidence. If the application is accepted, the Chair approves access to the Part I New User module. Applicant completes the New User Part I e-Module in preparation for Co-Tutoring a New User Part II Course. Supervising Tutor sends the reference to the Chair of the Training Committee. Chair of the Training Committee reviews the reference from the supervising Tutor. 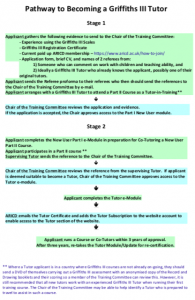 If applicant is deemed suitable to become a Tutor, Chair of the Training Committee approves access to the Tutor e-module. ARICD e-mails the Tutor Certificate and adds the Tutor Subscription to the website account to enable access to the Tutor section of the website. Applicant runs a Course or Co-Tutors within 3 years of approval. After three years, re-takes the Tutor Module/Update for re-certification. 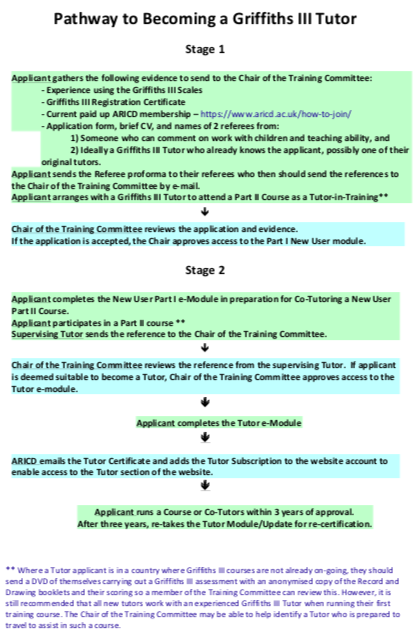 ** Where a Tutor applicant is in a country where Griffiths III courses are not already on-going, they should send a DVD of themselves carrying out a Griffiths III assessment with an anonymised copy of the Record and Drawing booklets and their scoring so a member of the Training Committee can review this. However, it is still recommended that all new tutors work with an experienced Griffiths III Tutor when running their first training course. The Chair of the Training Committee may be able to help identify a Tutor who is prepared to travel to assist in such a course.